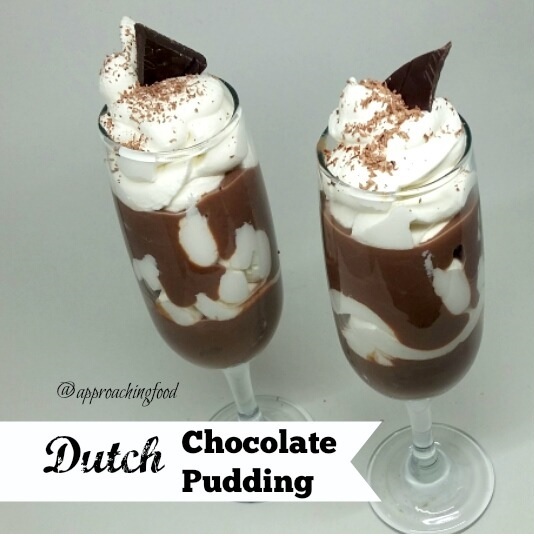 Elegance, thy name is chocolate pudding. Now let’s chow down! I’ve been craving dairy recently, and if you’re a returning reader of my blog, you’ll know I’m always up for some chocolate. So I decided to combine the two and make a batch of my grandmother’s chocolate pudding. My Oma (Dutch for grandmother) gave this recipe for Chocolade Vla (chocolate pudding) to my mom and my mom made it for special occasions, often topping it with whipped cream and chocolate eggs to make chocolate pudding nests for Easter. I think any day is a great day to eat chocolate pudding, so I’ve made this dish three times in the past two weeks. And since the DH isn’t fond of chocolate, I’ve eaten it all! I have no regrets though. It’s quick to made, and I think it’s actually not that unhealthy. It’s basically thickened, sweetened, flavoured milk. You doubt me? Check out this recipe! Heat 2 c. milk to just-before-boiling in a double boiler (around 170 degrees). In a bowl, mix the corn starch, cocoa, sugar, and salt together, and add in the remaining milk and stir until blended. Whisk into the heated milk, and cook on medium heat until thickened. Remove from heat and stir in vanilla extract. Pour into bowls and let cool. Serve with whipped cream (if that’s your thang) and chocolate shavings (definitely my thang!). Pourable pudding, poured into a glass custard cup, and topped with whipped cream and chocolate sprinkles. And a Dutch (Delft!) teaspoon to boot! FYI, “vla” is *slightly* different from traditional North American pudding (or even British-style custards), in that it’s slightly more liquidy. If you prefer a thicker pudding, add an additional tablespoon of corn starch. Oh, and definitely use a double-boiler to make this! It’s what my Oma recommended, and she was a smart cookie. As for me, I have little patience for things like double boilers. I mean, they’re useful, I should use them, but…they take so long to boil! Ugh. Just like when I’m heating milk for yoghurt, I tend to turn up the burner to high to get to the cooking part more quickly. Should I? No. Do I? Yes. Does it burn on the bottom? Unfortunately it does, all too often. Which is when I pull out my little kitchen trick. That’s right, it’s a…KITCHEN HACK! Boil a little water in the pot with a bunch of baking soda. The burnt bits will float right off, and the rest will wipe off with no scrubbing! That’s right, that’s all. It’s really just too simple! So I do recommend using a double-boiler, or cooking the pudding low to medium heat. Yes, it takes a few minutes longer, but it saves you a burnt pot. As for me and my house…I suspect I will keep turning up the heat and cleaning those pots! Ah well. At least I have chocolate pudding! Next Post: Maybe something healthy? Or should I post my Shortcut Cinnamon Buns recipe? Let me know in the comments! Linking Up at Meal Plan Monday! And again! This entry was posted in Desserts Not Otherwise Categorized on February 6, 2017 by Margaret. Pinned this recipe to try this week! Looks and sounds yummy!! 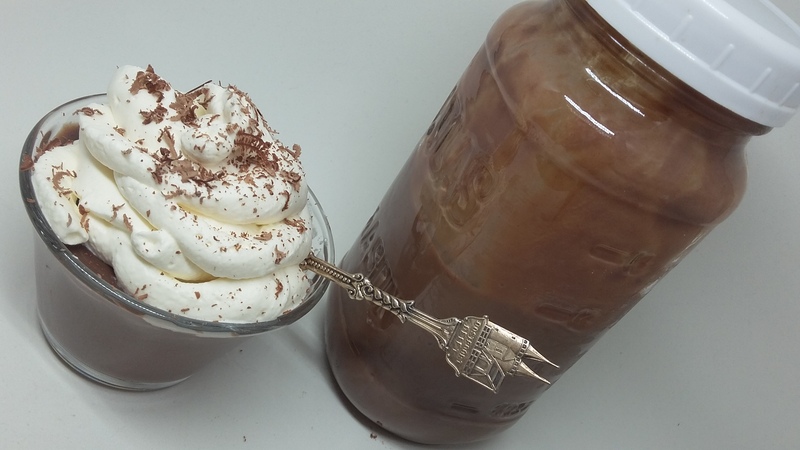 I’m a chocoholic, and this recipe is great! I love that it has a small amount of sugar. I did add the extra tablespoon of cornstarch for a thicker pudding. Thanks for giving us this recipe. Thanks for your comment, Jo! I also like that the recipe doesn’t have a ton of sugar — you can really taste the chocolate, this way! Yay for Grandmother’s recipes! I love recipes that have been handed down from generation to generation; so much love attached to them!